Reading and Writing Drum Tabs? e.g., 8th notes on the hi-hat, snare on 2 and 4, kick on 1, 3 and "3 and". You might want to look into an iPhone/iPad app called DrumStudio. It comes with some sample drum tab, which you can see and listen to, and it includes a drum tab editor which allows you to can write your own tab and it will play it. I highly recommend it - my students use it too. Disclaimers: I am not affiliated with DrumStudio or RollerChimp in any way - I'm just a happy user. Your mileage may vary, deuces are wild, etc. They claim that they use a standard notation (standard called Berkeley). There doesn't seem to be a universal standard (another common one is called Agostini). I use GP notation in my tabs and find it quite useful, but I'm not a drummer so I don't know if it is easy to read while playing. I reference GP6 as this is the only tab editor I ever used. My suggestion would be to check how each of the most used music notation software (Guitar Pro, Sibelus, Finale, MuseScore...) are displaying drum notation and use the one you prefer (they should be quite similar). And for the rhythm information, it is exactly the same as the standard music notation. The staff conveys at least 2 pieces of information : the "note" and its "value". The note indicate what you are playing, the value indicates the duration. For drums, this information indicates more the time between 2 hits, as most of the "notes" don't hold (but rests can be useful for cymbals). You can check this short tutorial for guitar pro, to see what I mean. Ted Reed's book "Progressive Steps to Syncopation" is aimed at drummers who want to acquire or improve music reading skills. It's meant to be used with an instructor if possible, but if you have a basic knowledge of how to read music, you can use it on your own. It starts from very basic stuff, like just quarter notes and quarter rests, and incrementally adds stuff like eighth notes, half rests, dotted notes, triplets, sixteenth notes, etc. When reading and especially when writing music for drums, keep in mind that the only thing important is when the hit happens; the duration of a note is simply a guide. What I'm trying to say is, it's the same to write a quarter note followed by a half-rest and a quarter rest, than writing just a whole note, since both will have the effect of just hitting a drum once at the start of a measure. Not the answer you're looking for? 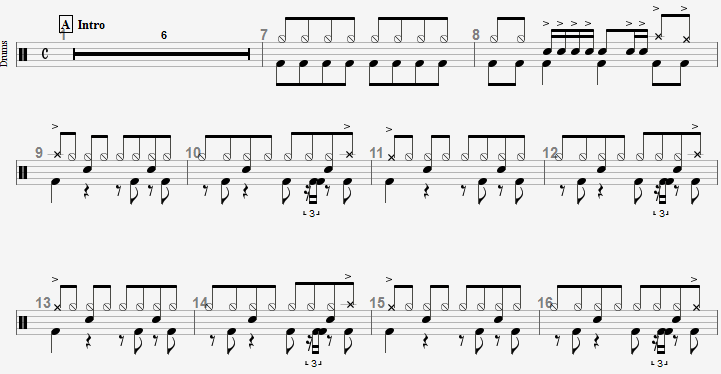 Browse other questions tagged drums tablature sight-reading or ask your own question.